For Plantar Fasciitis and Heels spurs we use gold standard Shockwave Therapy which is one of the most advanced non-surgical and non-invasive treatment available for a wide range of stubborn conditions that are difficult to treat using a conventional treatment approach. Shockwave Therapy will preclude the need for steroid injections and invasive surgeries and enable rapid relief from your pain. 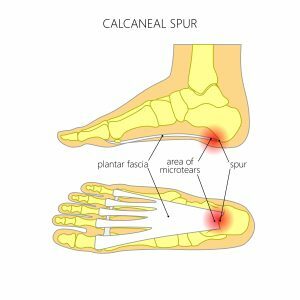 Typical Symptoms; Gradual development of heel pain that is worse in the mornings and exacerbated by long periods of walking or standing or even inactivity. Stretching the foot will also typically be very painful. 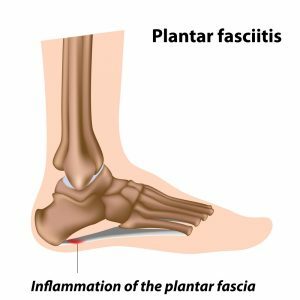 Plantar fasciitis is one of the most common causes of foot pain that we see. The plantar fascia is a thick band of strong connective tissue that connects and stretches the heel to the the toes in your foot. The plantar fascia serves as both a means of protection and support to the arch of your foot. A simple metaphor would be a structure organised like a bowstring that is designed to both attenuate and absorb shock. The basic underlying principal would be that if the tension in the bowstring becomes too extensive and repetitive (e.g. long distance running), small tears develop that lead to inflammation and irritation where the fascia inserts on the heel bone. Causes are multifarious and often there can be no apparent reason. Typical Symptoms; Heel pain in the morning or after resting that will be worse with the first steps you take (as the plantar fascia elongates) but often improves with activity. 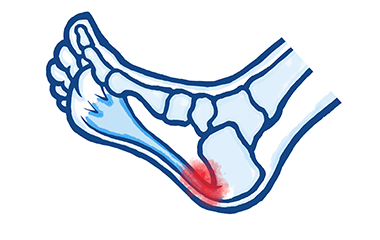 When you palpate the tender area you may feel a tender bony lump on your heel. A heel spur is a bony protrusion on the underside of your heel bone (or calcaneus) that protrudes forwards and essentially grows into arch of your foot causing pain. This condition is common and often accompanies plantar fasciitis (see above). The plantar fascia is comprised of a thick band of strong connective tissue. This tissue, if damaged, is normally repaired properly by fibroblastic activity (this produces new connective tissue). However if an injury does persist cells that produce bone (osteoblasts) are employed instead. These osteobalsts will form a bony heel spur that will be identifiable with an X-ray or ultrasound scan. We initially use a conservative treatment approaches that involve stretching excercises, the use of orthotics, shoe recommendations in combination with physical therapy. •Employed in a job that requires walking or standing on hard surfaces i.e. factory workers, teachers and waitresses. •With ageing the arch of your foot may weaken – putting extra stress on the plantar fascia. •Wearing shoes with inadequate support.